This blog was first published in March 2018 and was updated on 1 February 2019. 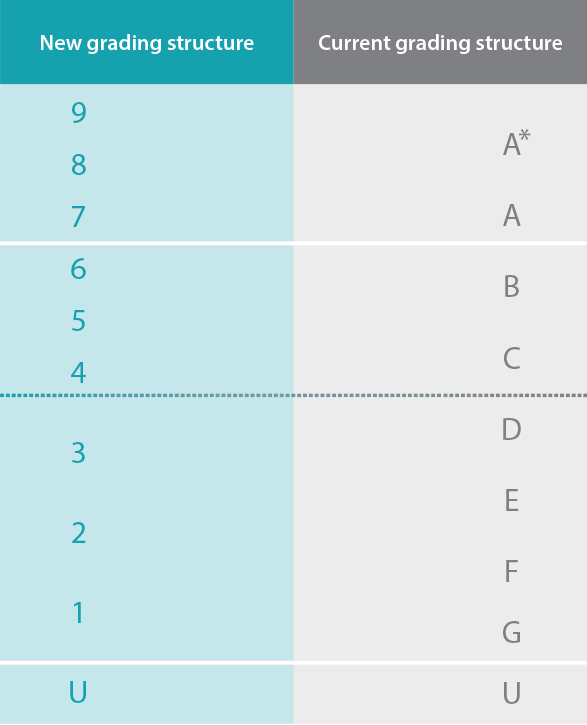 If you have children in year 11 taking GCSEs this year, many of their results will be reported on the new grade scale which runs from 9 (the highest grade) to 1 (the lowest grade). Here’s a brief guide to what that means. Why do we need a new grade scale for GCSEs? GCSEs in England have been reformed to keep pace with universities’ and employers’ demands. They are based on new and more demanding subject content but are still suitable for the same wide range of abilities. 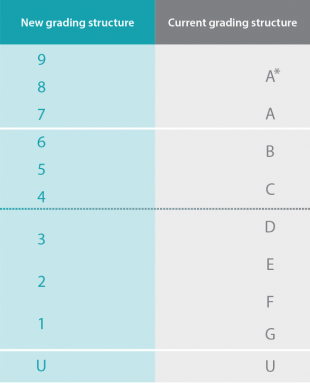 The new grade scale makes it clear to everyone that students have studied the new GCSEs. It also has more higher grades compared to the old A* to G grades, to give sixth forms, colleges, universities and employers the opportunity to better distinguish between students of different abilities. Do all GCSE subjects use the new grade scale? How do the new grades relate to the old ones? We have designed the grading so that there are comparable points at key grades. The bottom of a grade 7 is comparable to the bottom of the old grade A, the bottom of a new grade 4 is comparable to the bottom of the old grade C, and the bottom of the new grade 1 is comparable to the bottom of the old grade G. We have been clear to employers, universities and others that if they previously set entry requirements of at least a grade C, then the equivalent now would be to require at least grade 4. Will my child be disadvantaged taking these new exams? In short, no. We know that it takes a few years for teachers and students to get used to new qualifications. There are fewer past exam papers for students to practise on, fewer teaching resources available, and teachers are not as familiar with the new qualifications as they were with the old ones. We recognise that it would not be fair to penalise students for this, so the exam boards use statistics to help set grade boundaries, so that, for example, a student who would have previously got a grade C or above would be expected to get a grade 4 or above in the new GCSEs. So while the content and assessment have changed, don’t worry, we’ll make sure that grades are awarded fairly and your child will not be disadvantaged by the changes. Students taking science will take one or more separate sciences – biology, chemistry and physics – or combined science. Combined science is really two GCSEs rolled into one qualification. Students will study biology, chemistry and physics but they won’t cover as much content as those students sitting separate sciences. Combined science students will get an award consisting of two equal or adjacent grades from 9 to 1 (eg 9-9, 9-8, 8-8 through to 1-1), and it will count as two GCSEs when students apply for jobs, sixth form, or to university. If you have any concerns or want any advice, please do talk to your child’s school. You can also find more information by subscribing to our Facebook page. GCSE results day this year is 22 August 2019. New reformed quals Ofqual, keep up! We'd like to say that was a deliberate mistake. Sadly not. Thanks for letting us know. You were made aware of this over six months ago. So, please could you change the spelling to 'practise' to reflect the fact that it is used here as a verb and not a noun? I would expect the government blog for the organisation responsible for maintaining standards and confidence in qualifications to model an impeccable standard of English! That's been corrected now. Thanks Tania. Good to know. Would be nice if you actually told students this and the teachers that are supposed to be marking them. It is one month before my first exam and we have been told by AQA officials themselves that they do not have a clue how to mark our work, our teacher cannot give us a predicted GCSE grade and we have no idea what amount or quality of work represents each of these levels. This entire system is a tragedy of epic proportions. You're right, not sure how that happened but thanks for letting us know. I think there is an error on the page. This link states that GCSE results are out on 16th August – that is the date for A Levels. GCSE results are 23rd August to students. Quite right, many thanks for taking the time to let us know. This would be common with most year 7 students as a grade 3 in year 7 isn't totally equivalent to a gcse grade. If she took gcse PE in year 10-11 she will achieve a lot higher. I've know kids who got a grade 2 in year 7 in English but are now getting a grade 7 in year 10. Hope this helps. How do I subscribe to the Facebook page???? I am really concerned that my son is being disadvantaged by taking his exams this year as no one really seems to know what is going to happen. For instance he has been sitting mock exams on stuff that he hasn't even covered yet in school. With teachers saying they thought the mock papers are hard??? This doesn't help the confidence of the student or reduces the stress when their exams are only weeks away! He said the new course work is harder. My grandson had questions his teacher hadn’t covered especially in sciences, he has been in top group across the board throughout his school years and l feel this new system is very unfair for the first time sitters. Teachers should have had more training before these exams were brought in. All these first sitters should be ask if they would like to take the old exam as well as the new and they should be able to use which ever exam paper they wish to present. It would also help officials to determine if the new exam was just and fair. I hate the new GCSE I'm in yr11 and I revise of past papers, however there aren't any and no grade boundaries, they should give a rough guide for the grade boundaries, it is a mess for my year and its unfair! They have made it so much harder which is pointless if you don't want to take the subject up for A-level! Exam boards have given no guidance or support, this is terrible and a ridiculous new system! Quite agree. So many are at a instant disadvantage. Very unfair on GCSE pupils this year. How can any of them be sure they will be graded correctly. Someone should be held responsible for this mess. 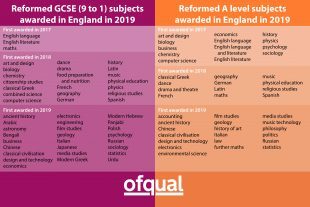 We have been clear that the new 9 to 1 grades will align with the old A* to G grades, so that in general a student who would previously have achieved a grade C would achieve a grade 4 in the new qualifications. This is to make sure that students this year are not disadvantaged by factors such as the fact that there are no past papers, and teachers are less familiar with the requirements of the new system. Exam boards have provided specimen papers, and additional specimen papers in some subjects, and they have also published additional support material for teachers. Experience from the first new GCSEs in 2017 shows that schools and colleges coped well with the changes, and results were in line with expectations. Search results for My daughter sat her GCSE paper in June and 4 of the questions were not even on the syllabus. She was achieved an 8 in her mocks. He teacher told her she could not have revised for it as it wasn’t on the syllabus. The students came out of that first exam absolutely destroy ed. What are you trying to do to these young people? You don't say which subject this was for, but your daughter's school will need to get in touch with the relevant exam board (if they haven't already). We are not aware of any cases where this has happened, so if you can provide further details to public.enquiries@ofqual.gov.uk we will follow it up. Isn’t it the top 7% of the 8’s?? If your question is about how grade 9 will be calculated in the first year, there is more information here. Nothing wrong with the old grading system. This whole thing created jobs for government staff who would be out of work otherwise! The new grade scale better differentiates between abilities of students at the top end, so when we say that grades 4, 5 and 6 are comparable to grades B and C in the old system, it means that the students who would have achieved a B or a C previously can now expect get a 4, 5, or 6, so there is more differentiation in this range. It is the same with comparing grades 7, 8 and 9 with grades A and A* in the old system. It is not good or bad; it is high or low. There is a range of marks for each grade.By replacing B & C with 4,5,6, the ranges are smaller. If grade B was awarded for 60-70% & grade C for 50-59% then now grade 6 might be 64-70%, grade 5 57-63% & grade 4 50-56%. Changing things always complicated things, but we get used to them! (Right headache for teachers though). I sat the first GCSEs in 1988! The percentages in Nicola's comment are not actual grade boundaries, I believe she used them for illustrative purposes. In addition to this, the number of marks will be different to the percentage of marks achieved, as the maximum number of available marks is generally more than 100. If you are looking at maths foundation, it is worth noting that the grades available are 5 to 1, so the grade boundaries will differ to those on the higher tier paper. You can read more about this here.